As well as being another of the major mineral family, the Potassium mineral is also related to the electrolyte family. The other members of this family include sodium and chloride. Unlike sodium and chloride which are found mainly in the body fluids that surround cells, approximately 95% of the body's potassium is stored in the body fluids inside the cells. One of the most important roles of potassium is its ability to control how the nerves and muscles act. 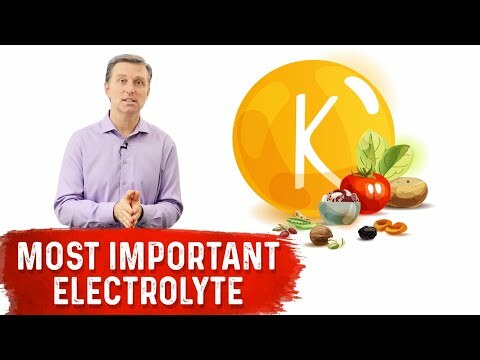 The balance of electrolytes passing in and out of cell membranes is what creates the electrical charges that help cells communicate with one another. The electrical impulses are also what cause muscles to contract. As one of the body's largest muscles, the heart relies on a steady supply of potassium and the other electrolytes to keep it beating rhythmically around the clock. This mineral is also what controls the creation as well as the storage of the muscles' main source of fuel, glycogen. The Potassium mineral also assists in the process of converting glucose, or blood sugar, into glycogen. Tests conducted on individuals with high blood pressure have shown that increasing the amount of potassium has helped them to lower their blood pressure. Tests have also shown that potassium can help relieve the pain of those suffering from arthritis by helping to remove the pain-causing acids from affected joints. When acid levels become too high, potassium can help neutralize the excess acids inside the body. It also brings relief to those suffering headaches and migraines. The lungs would not be able to eliminate carbon dioxide and the kidneys could not function properly without potassium. The Potassium mineral is also responsible for controlling the water balance which is why symptoms of a potassium deficiency include an unquenchable thirst and inability to urinate. Providing the body with ample amounts of potassium all through life can help keep the bones from losing mass, a condition that leads to osteoporosis. Eating produce is the best way to ensure the body gets an ample supply of this all-important mineral. Bananas, oranges, grapefruit, kiwi, orange juice, dates, apricots, prunes, potatoes, tomatoes, avocados and other fresh produce are excellent sources. Potassium is also found in legumes, meat, fish, poultry, whole grains and dairy products. Interestingly, there isn't a recommended daily allowance for potassium. Fortunately most people are able to get enough potassium simply by consuming orange juice, potatoes and bananas. Potassium is a water-soluble mineral which means that excess amounts are safely eliminated from the body via the urine, so dangers from excess amounts rarely develop. However, individuals with kidneys that don't function normally are prone to heart trouble. Potassium deficiency is possible especially as a result of excessive vomiting, diarrhea, diuretics and laxative misuse. Water retention, a loss of appetite, fatigue, insomnia, nausea, irregular heart beating, poor circulation, diabetes, earaches and headaches, hypertension, pain in the abdomen, nerves and muscles that don't function normally, a thirst that cannot be quenched, and an overall feeling of weakness are the symptoms most often associated with a potassium deficiency.